Good morning badcast. My wife and I fish out of FPI all the time. Last week we fished the shallow reefs 30' and we brought home porgies, lane snapper, and grunts. We also caught a tarpon, too many blue runners to count, a few short mutton snapper, a few short yellow tail snapper, a few short black sea bass, and a shark. One of our favorite reefs to fish is actually in 50'-60' of water and we always catch lager lane snapper and porgies. 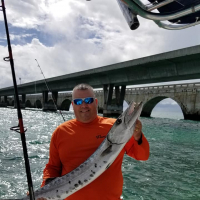 We also have catch sheepshead, bonita, barracudas, mangrove snapper, black sea bass, some grouper, yellow tail snapper, Cobia, King fish, and the occasional shark. My wife and I have found the shallow reefs to be very productive for bringing fish home. Wen you go out let us know how you do. Tight lines!!! There is another reef around 80' with nice mangroves, muttons, etc. We limited out on ARS this past two weekends . We also fish out of Fort Pierce and I think I know the 55ft spot he fishes... LOL lots of lanes there... we fish all public numbers and the Amazon is a decent place to go in around 90. There are several in closer too... Good luck.